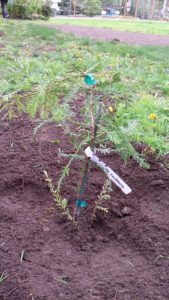 Ten coast redwood saplings were delivered to Lake Forest Park on March 9, 2017. 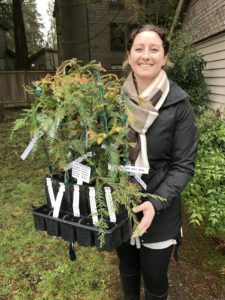 Cory Roche, Community Volunteer Coordinator, takes delivery of ten redwood saplings for the city of Lake Forest Park on March 9, 2017. Planting is expected to occur on Saturday, March 18, 2017. 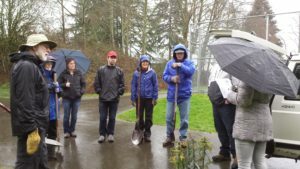 The Lake Forest Park mayor and volunteers gather in the rain preparing to plant redwood saplings in Lake Forest Park’s Horizon View Park on March 18, 2017. 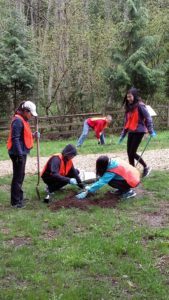 Two redwood saplings, one near and one far, planted in Horizon View Park in Lake Forest Park on March 18, 2017. 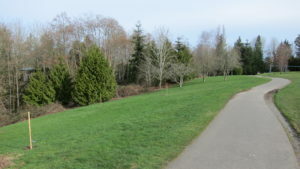 Three stakes mark the spots where redwood saplings were planted in Horizon View Park in Lake Forest Park on March 18, 2017. 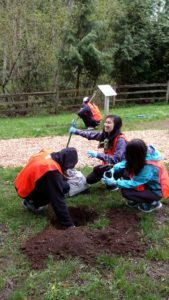 Lake Forest Park Youth Council volunteers getting holes dug for more redwood saplings to be planted on April 22, 2017 in Pfingst Animal Acres Park in Lake Forest Park. Getting the young redwood sapling, a clone of the Fieldbrook stump, snugged into its new home in Pfingst Animal Acres Park in Lake Forest Park. 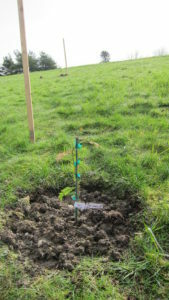 Newly planted on April 22, 2017, this redwood sapling has the same genetic make-up as the Fieldbrook stump, which had a diameter of 32 feet and a circumference of 109 feet. See next photo. 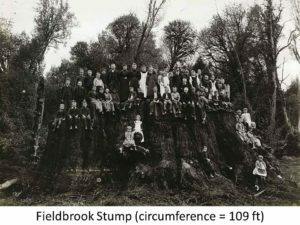 The Fieldbrook tree was cut down in 1890. If it were alive today, it would likely be over 400 feet tall and over 3500 years old and be the largest tree by height and volume on the planet. 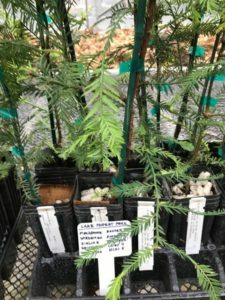 Ten coast redwood saplings ready for delivery to Lake Forest Park in January 2017.